For the adventures and the pats on the back, for building your Barbie house and the fishing trips, for the rugby matches and the times he let you sit on his lap and “steer the car”, for the swing in the tree and the swimming lessons, your dad deserves to be appreciated this Father’s Day. There are so many amazing dads out there and each one of them deserves to be treated to something special on 16 June. If there is one thing that all dads appreciate, it’s a good meal and the company of the people he loves. If you were wondering what to do this year, look no further. 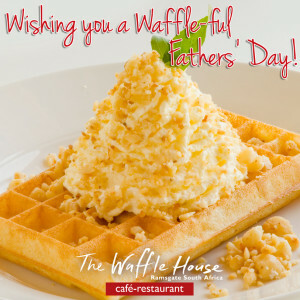 Join us at The Waffle House in KZN this Father’s Day for as many waffles as your dad can handle. We have waffles in sweet and savoury varieties that leave you wanting more. Along with treating pops to a tasty meal, there are beers and ciders to sip on in the afternoon sun. A day doesn’t get any better than that. Take the time to make some new memories on 16 June and get to know the man that you call dad.